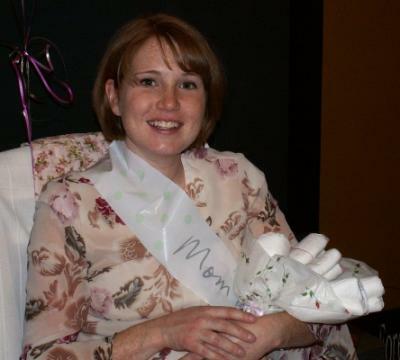 We had a mod mom baby shower for a very good friend of mine. She had longingly wanted a baby girl for a while and after 2 boys she finally got one. So we had to throw her a baby shower to celebrate! We had an open house baby shower for her. We loved the chocolate brown and pink colors so I went with the mod mom stripes and polka dots on the plates, napkins and table. 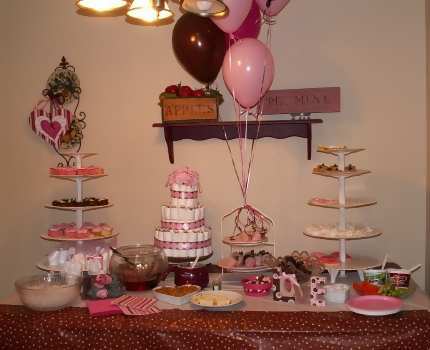 Since girls are sugar sweet, the food was all sugary and sweet. We had lemon bars, sugar cookies, wedding cookies, Hershey's Kiss cookies, pink and brown whoppers, brownies and pink and white cake. We also had chocolate fondue with fruit to dip and a vegetable tray (for those who would like to stick to their diets :). Our punch was made from cranberry juice and sprite (very yummy). We made the baby bootie favors from the website and filled them with Hershey's Kisses and whoppers. 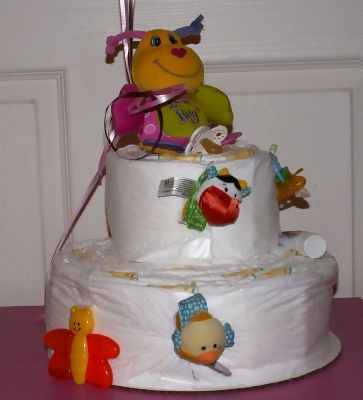 There were 2 diaper cakes at the party and a diaper bouquet- all made by guests. 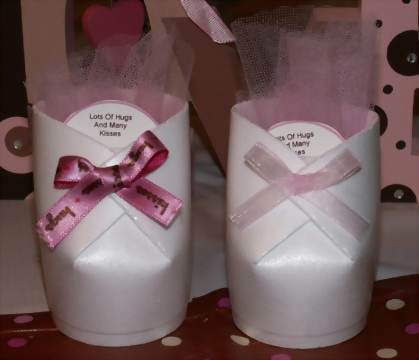 For favors, we made baby bootie cups with Hershey's Kisses inside. The inscription on it read..."Lots of hugs and many kisses, for sharing in our baby wishes." We also did a gift pool as it had been a few years since she had her last child and she needed everything. We were able to get her a new swing, stroller and high chair. There were so many people there to support her. The baby shower was a huge success! Any editing program that allows you to draw or insert shapes should work for that. I went into Microsoft Word and it has a function to insert shapes. I tried it and you can choose to have it outlined. Then just use the text tool to insert the text in the middle. They have all kinds of shapes, so you don't need to stick with a circle. The only problem is trying to get the shapes to match up size wise. I noticed when I was playing around with it that under "drawing tools" in the far right corner they have a height and width option. I set it to 2 and it seemed to fix the size issue. BTW, my Microsoft word is a 2010, so if you have an older version, it might be set up a little different. Hope that helps! "Lots of Hugs and Many Kisses For Sharing in Our Baby Wishes"
I ran out of time, so it was tucked into the front of the baby booties. On the inside of the baby booties, I had tulle circles with hugs and kisses candies in them. What I was planning on doing was use a hole puncher to punch a hole in the top of the circle. I had tied curling ribbon around the tulle circles and I was going to thread the circles with the curling ribbon to attach it to the candies. Hope that helps. Best of luck with your baby booties! Hello I love your Styrofoam booties. I am going to use this awesome idea for my friends baby shower. Now my question to you is what did you use to write "lots of love.." inscription on? I was gonna just print it on paper and glue it on but I was curious how you did it. Thank you so much for sharing with us..